2 miles west of my location . Luxury accommodations you can afford . The Liars Den Lodge is a Hide-a-Way for Steelhead Fisherman. 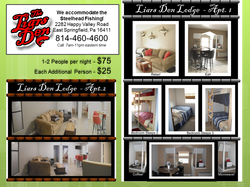 Located in East Springfield, Pa, we are in the center of Steelhead Alley and a few miles from Lake Erie. We have two rooms available at the Liars Den Lodge. Room #1 has 5 single beds (and a couch), cable, A/C, WIFI, refrig, full coffee pot, micro., DVD player. Room #2 has 2 double beds, 2 singles (and a couch), cable, A/C, WIFI, refrig, full coffee pot, micro., DVD player. You will also have access to our fish cleaning station, freezer space, plenty of parking, a grill & picnic table, and a campfire pit. 1/4 mile west of my location . 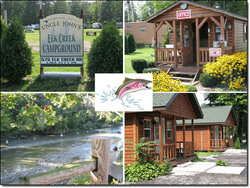 Cabins , tent sites , camper sites available .